This compass does not point to the north, it points to the thing you want the most in this world. 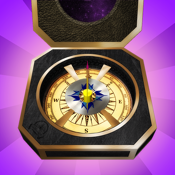 Ever asked yourself where your Magic Compass would lead you? Take the compass, touch it until your energy flows and the compass will magically show you the direction to your most desired thing! * Easy and powerful Customization to serve your needs! * Short tap before use to predetermine the direction and to fake your friends! * Don't know what to wear today? - Use the compass! * Need to flip a coin?